Town striker James Collins has been nominated for the EFL Player of the Year, as well as being named in the EFL League One Team of the Season alongside Hatters defenders Jack Stacey and James Justin. Collins’ superb form this campaign has seen him score 20 goals in the league, to win a call-up to the Republic of Ireland international squad last week. He will be up against Doncaster striker John Marquis and Sunderland winger Aiden McGeady for the award, with boss Mick Harford saying: "Since joining this club, Collo has been absolutely terrific. "He’s a real handful for any defender, has scored a lot of goals and his nomination for this award comes as little surprise. Meanwhile, Stacey and Justin – who has also been nominated for the EFL Young Player of the Year – have helped the Hatters keep 19 league clean sheets this season, as well as netting seven goals between them. Harford added: “Having good full-backs in our system plays a big part in our success, and undoubtedly JJ and Stace’s consistently strong performances have been of paramount importance. 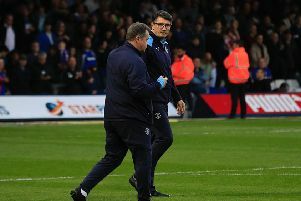 There is no place for Luton trio Sonny Bradley, Matty Pearson and Andrew Shinnie in the side, while former Hatter Cameron McGeehan is included, with the Barnsley manager Daniel Stendel in charge. League One Team of the Year: Adam Davies (Barnsley), Jack Stacey (Luton), James Justin (Luton), Matt Clarke (Portsmouth), Ethan Pinnock (Barnsley), Alex Mowatt (Barnsley), Herbie Kane (Doncaster), Cameron McGeehan (Barnsley), Aiden McGready (Sunderland), James Collins (Luton), John Marquis (Doncaster). Manager: Daniel Stendel (Barnsley).